383 people in our community are currently praying with you. This Benedictus by Mozart is exquisite. The Latin words are short and easy to follow: "Benedictus qui venit in nomine Domini. Hosanna in excelsis." In English, "Blessed is he who comes in the name of the Lord. Hosannah in the highest." It is suitable either to listen to attentively, or to play as a soft background for prayer and meditation. So he went and took them and brought them to his mother, and his mother prepared savory food, such as his father loved. Then Rebekah took the best garments of Esau her older son, which were with her in the house, and put them on Jacob her younger son. And the skins of the young goats she put on his hands and on the smooth part of his neck. And she put the food and the bread, which she had prepared, into the hand of her son Jacob. So he went in to his father and said, "My father." And he said, "Here I am. Who are you, my son?" Jacob said to his father, "I am Esau your firstborn. I have done as you told me; now sit up and eat of my game, that your soul may bless me." But Isaac said to his son, "How is it that you have found it so quickly, my son?" He answered, "Because the Lord your God granted me success." The tale of Jacob and Esau often puzzles readers, because of the contradiction between Jacob's righteousness and fraudulence. He is to get the blessing of Isaac, the heir of Abraham, and become the third of this line of three men to whom God has promised so much: the land of Canaan, descendants who will become a great nation (the Hebrews), and most important, special status as the people who will be blessed by God and will be the keepers of his covenant. 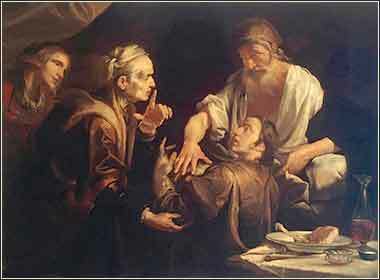 But juxtaposed to his unique status — the patriarch of God's holy people — we see Jacob participating in a seedy little fraud to deceive his father. And it is by no means a minor fraud. He seeks to steal from his brother the very position of patriarch, and to defraud his father into naming him his heir, by fooling blind Isaac into mistaking him for Esau. How can one lie and cheat his way into the position of the patriarch of God's covenant? Although we will never understand God's mind, Jacob gives us the basic answer in this selection: "Because the Lord your God granted me success." God has not given the Law to the world at this point; Moses will not be born for centuries. There is no commandment to forbid stealing. Of course, the answer that the Law does not yet exist is not completely satisfactory, because as Paul will tell us in Romans, the Law did not make theft a sin; it only showed the Hebrews that they were sinning. But God's plan works itself out slowly in human terms. He did not snap his fingers and create the Christian church, but worked it out in a slow succession of events. Isaac Blessing Jacob by Giacchiano Assereto, Italian, c. 1640. Notice the goatskin jacket worn by Jacob and Rebekah holding a finger to her mouth, as if she fears Jacob will blurt out the truth.